I attached 2 images. One has the instagram tag and website, the other image doesnt. I would like the instagram tag and website to be placed in the same spot as the picture that has it. Can you make it look as realistic as possible. 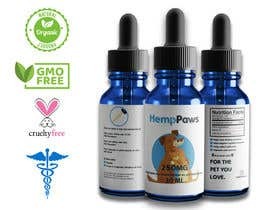 Also where the one says "30ML" Can you make it match and say "30 mL / 1 FL OZ"
And where it says "MADE WITH FULL SPECTRUM HEMP OIL AND SALMON OIL" can you make it match and say "FULL SPECTRUM HEMP OIL AND SALMON OIL" like the other one. One is glossy and one is matte so try your best to make it seamless!